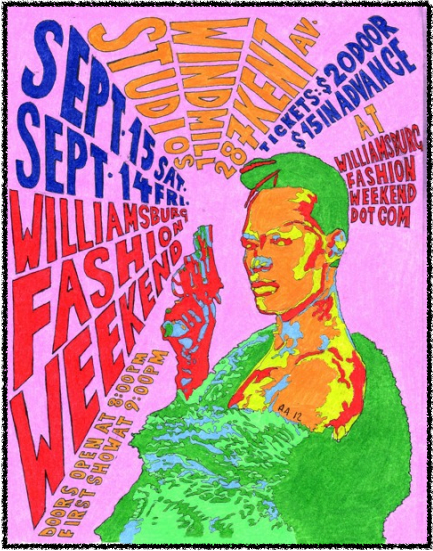 This evening kicks off Williamnsburg Fashion Weekend, the biggest event in Brooklyn fashion. This event actually is not to be missed! (if you miss it all your friends will be talking about if for months and you'll just be sitting there quietly weeping inside). Unlike all assholes who mass mail us everyday calling things "not to be missed" this event is iconic revolutionary, and for real dudes its important. At 10:30 sharp we're setting it off on the big screen with a new movie by Eli Heuer starring Guidance Dog, Fried Egg Lady, Elephant Man-Child, Colin Self, Alexandra Drewchin Jr, Beth Ferrell and Tucker Rountree. It takes place in ZD in 3D.. It's so beautiful. Then Colin Self presents RHLS PHA-SHUN on the runway. A fashion show like you've never experienced before. Featuring THE Kae Burke with the House of Yes modeling posse. SURPRISE! MOVES is Moving! Big Party Sunday 6-10PM! Mombucha Sunday! Kombucha-making workshop at MOVES!